One year ago, when we had our “Men of Woodbury Epic Retreat” up at Larsmont on the north shore of Lake Superior, April turned from kind and welcoming to vicious and cruel. 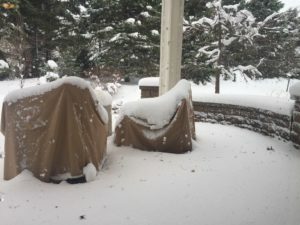 A massive snow storm hit the northern plains and we were “holed up” in two luxury condos riding the storm out (cue REO Speedwagon). The waves on the lake were 20-30 feet high and crashing ashore just yards from the building. It was a lousy and cruel way to say hello to spring, but somehow we had riotous fun anyway. So here we are again. We’ve been hearing about this storm since before the upper-level disturbance even formed out west. At first it was “a mix of snow and rain” with 1 to 3 inches predicted. Then it was six inches. Then, overnight, the forecast changed considerably. There were some models that suggested the Twin Cities might see as much as 24 inches of heavy wet snow, and the National Weather Service went so far as to even caution us that it could be a “shutdown event” followed by the words “be prepared.” So we knew something was coming. It was just a matter of what and how much. It was pretty obvious that the gradient for this storm was going to be narrow, meaning that the distance between true blizzard amounts and just nuisance snow would be unusually short. To the point where parts of the Twin Cities might be getting buried while other suburbs got little at all. The temperature would have a lot to do with that. The whole thing was predicted to happen over 36 hours with the thermometer hovering in the 32 to 34-degree range. It started a little ahead of schedule yesterday, with the snow beginning around 3:00 in the afternoon. We had tickets, along with our friends Terry and Lynn Blake, to have dinner and see yet another concert at The Dakota in Minneapolis, and the plan was for us to drive to their house, here in Woodbury, and then Terry would drive all of us to downtown Minneapolis. It took an hour to get there, and we were surprised we managed to do it that fast. At the time, it was coming down hard and was very slushy. When we did get parked and inside, our biggest fear was what we’d see when we exited the venue four or five hours later. Turned out we dodged that bullet, as the temperature rose a bit to turn it temporarily to rain. That good fortune wouldn’t last, as you can see in the photos. It’s not snowing right now, and we may be past the worst of it, but the real issue is wind. Even though this stuff is really heavy and wet, the wind is gusting up to 45 mph and it’s blowing the snow everywhere, which means it’s drifting across the roads and highways. There are wrecks and road closures galore, from neighborhood streets all the way to the interstates. I-94 is currently closed in both directions up by St. Cloud, while they attempt to clear multiple big rigs that have jackknifed. It’s no fun. Me? I’m treating it as a snow day. Even to the point of wearing sweat pants all day. 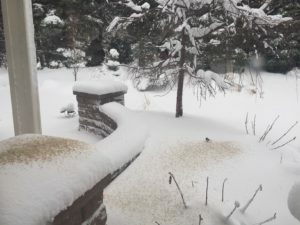 A few hours ago I noticed a large number of small birds, of the finch variety, scouring the snow behind our house in the hope of finding something, anything, to eat. Our feeder is empty, and considering it’s hard to fill on a dry warm day, it’s basically impossible to fill it now. So, for the sake of the little birdies, I did the next best thing. I tossed a bunch of bird seed out onto the snow for them. The little guy in this photo was the first to find it. He must’ve gone and told his friends, because now we have a dozen little guys out there. If they eat it all, I’ll toss out more. And our feeder is empty for more than the one reason you’d expect (that being “the birds ate it all.”) It’s touted as a squirrel-proof feeder, because the little perches are spring loaded and if more weight than a typical small bird pushes on any perch it will close. Squirrels are WAY smarter than that. We have a couple who have figured out how to do gymnastics to get at the food. They hold onto a branch with their hind feet and reach out to grab the feeder, then they grip the perch at the sides instead of at the front edge so that it doesn’t push down and close, and laying out flat like a gymnast on the parallel bars, they gorge themselves. It’s fascinating to watch, as they practically defy gravity, but also a bit infuriating. 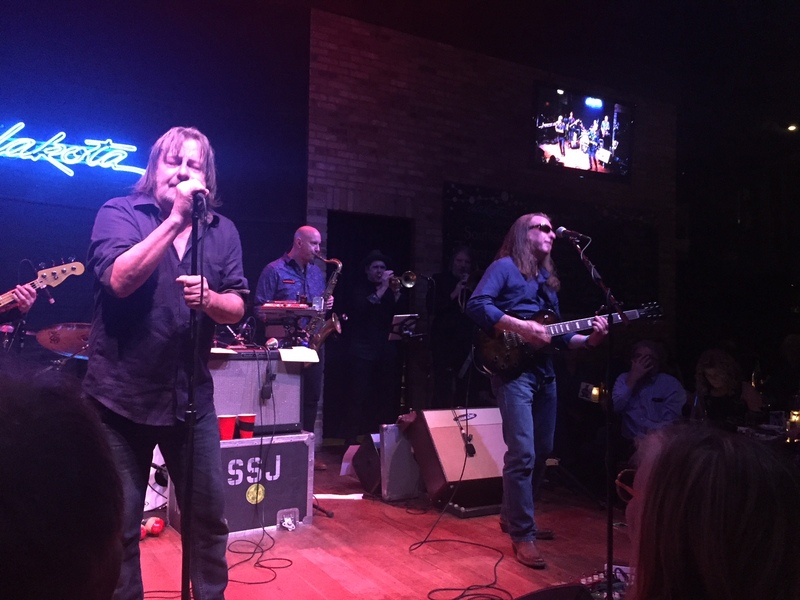 On Monday, Barbara and I had tickets to see Southside Johnny and the Asbury Jukes at, wait for it… The Dakota. It’s our new favorite music and dining venue in the Twin Cities. The show was great, the people sitting around us were fun, and we had a fantastic time. The only hitch to the whole thing was the fact we had no idea that Minneapolis was going to be a wall-to-wall zoo on this particular Monday night, back when she bought the tickets. The championship game of the NCAA Basketball Tournament was at US Bank Stadium just a few blocks away. 77,000 fans would be attending. Also, as part of the festivities, entire blocks of downtown were shut down so that fun stuff could happen in the streets. One of those streets, Nicollet Mall, just happens to be the street The Dakota is on. A large ferris wheel was actually in the middle of the road right outside the club, and the entire area was packed with basketball fans. It was pretty crazy, but the vibe was fantastic. Everyone was having fun on a warm and dry Monday night. To make it more of a challenge, a number of other streets were blocked off near the stadium, for security reasons. Since we typically enter downtown from the eastern edge of it, literally driving right alongside the giant stadium which is just off the interstate, we were going to need an alternate route. I mapped that out, having us drive around downtown on I-94 to enter the area from the west side and then work our way back to The Dakota, but the problem was traffic. The first part of the trip, through St. Paul and the Midway area between the cities, went well. The last six miles or so were done at a walking pace. It was nearly gridlock anywhere near downtown, but the plan worked and we got in on time. Dinner was fabulous, the wine flowed freely, and the show was fantastic. 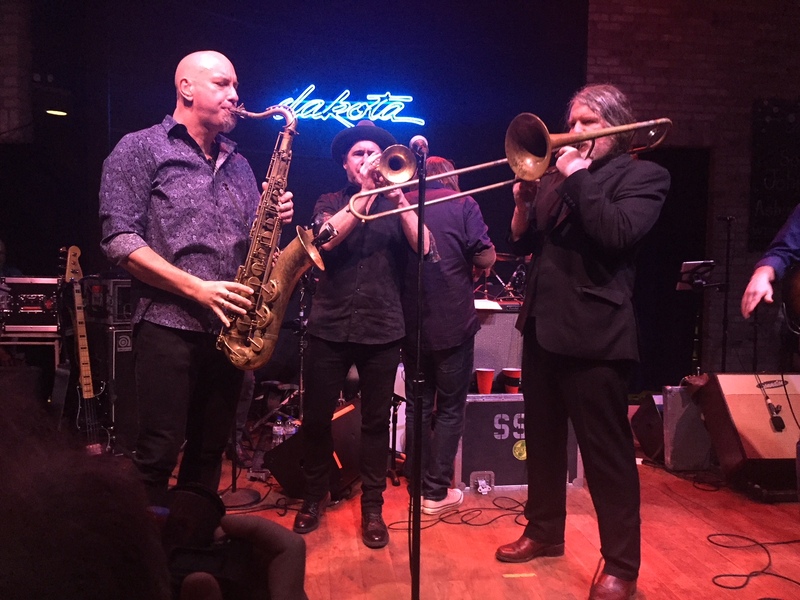 I was fairly stunned that they were able to get a three-piece horn section, a drummer, a bass player, a guitarist, a keyboard player, and Southside Johnny himself all on the tiny Dakota stage, but they rocked the house. If you’re not familiar with Southside Johnny, he’s been part of the Bruce Springsteen universe for decades. They emerged out of New Jersey at the same time, playing very similar styles of music, and they share a lot of songs with each other. The band has a real E Street sound, and they’re all great musicians. It was a lot of fun. 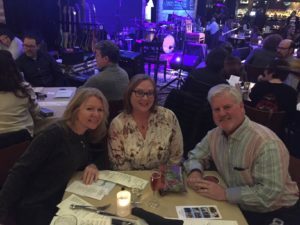 We were at a table at the front of the stage, with just one other couple between us and the band. Near the end of the show Johnny was talking about the merchandise and CDs they had for sale and Barb had already bought one. She held it up to show him, and Johnny said “Let me see that.” She handed it to him and he put it in his back pocket, saying “Now she has to buy another one!” That got a laugh out of the crowd, and my wife. When the show was about to end, Barb yelled “Where’s my CD?” to him, and he just said “Nah, we’re not doing that” and then they walked off the stage. She had a kind of shocked look on her face and those around us were saying “I guess you’re not getting it back” in a kind of surprised bemusement. Then, a roadie who looked to be about 85 years old came out on stage holding the CD. He spotted Barb but then made a motion like he was signing it, obviously meaning “Do you want this autographed?” and when Barbara nodded he went behind the curtain and came back with Southside Johnny’s autograph on the sleeve. Cool evening, but we had one more challenge. I thought the basketball game would still be far from over by the time the show ended, but the band played a long time and when we left I checked my phone and saw that the game was almost over, and about to go into overtime. No way we could drive the short route home, because it goes right by the stadium. So we went with Plan B.
I’d mapped out a route to take us directly south a mile or two, where we could get on I-35 and take it south to near the airport, then we drove home from there. Worked like a charm. No traffic at all. Two nights later, which would be last night, we were back at The Dakota again. This time with no basketball game going on and all the streets opened. Crazy to see it all back to normal in just 48 hours. No sign of any ferris wheel. Terry did a great job getting us there, and we enjoyed our dinner before the show started. It’s a real treat to have great servers bringing food and drinks right there at your table in such an intimate venue. And the food is pretty amazing. 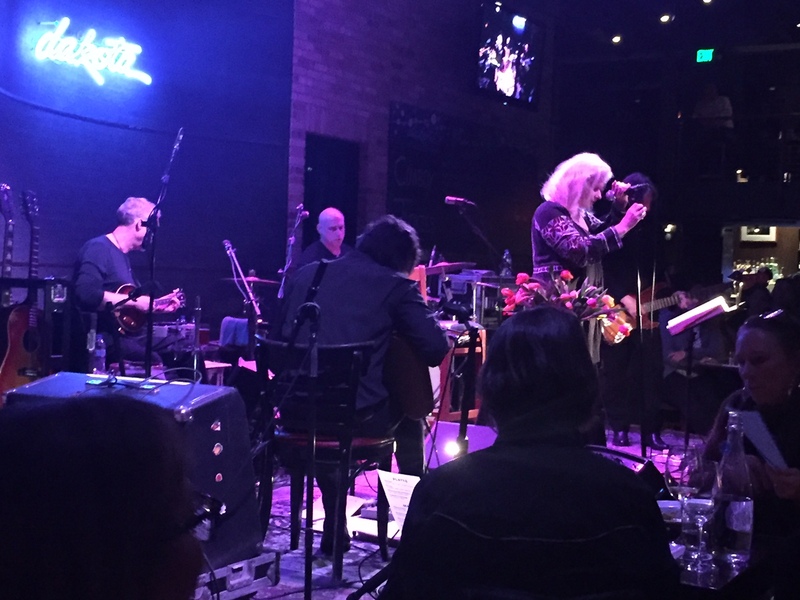 The show featured a great band by the name of Cowboy Junkies. If you’ve never heard of them, they are not junkies. And they’re not cowboys. What they are is a totally unique band that creates a sound like no other band I’ve heard. And, as I posted on Facebook today, I’m still trying to figure out why I like them so much, because their style is about 180-degrees out from the harder stuff I normally listen to. The band is made up of two brothers, Michael Timmins (guitars) and Peter Timmins (drums), along with their sister Margo (vocals) and a guy named Alan Anton (bass) who has known Michael since kindergarten. They’ve been recording and touring for 32 years now, with the exact same lineup. They are all from Toronto. I discovered Cowboy Junkies around 1998 when we were living in Austin. They have a soft “spooky” sound, with waves of guitars and drums under the vocals. I think I like them so much because they’re all really smart and really talented, and that shows in the wonderfully inventive music they create. I’ve never heard another band that sounds like Cowboy Junkies. A huge (enormous) part of that is Margo’s voice. It’s from another world. Sort of a sound you might hear in a 1950s smoky piano bar, but with a modern edge to it. She’s incredible. After our fantastic dinner we cheered as they walked on the tiny stage, and the first words out of Margo’s voice created one of those “Wow” moments for me. I’ve been listening to her sing for more than 20 years, but this was the first time I’d heard her, and the band, in person. What a great place to experience it. I don’t recall one moment during the two-hour show when I was bored or thinking “OK, let’s move on to the next song now…” You don’t really sit there and just listen to the Junkies. You kind of bask in it, and let it all wash over you. It was really a memorable (unforgettable) experience. I’m so glad I finally got to see this band. It was a magical night, with great friends, sharing fantastic food and drink. And did I mention that Margo Timmins can really sing? Wow… If you’re not a fan or never heard of Cowboy Junkies, just check them out on YouTube. I think everything I just wrote about how they sound and what they do will make better sense if you do. Heck, here’s a direct link to an old video from the late 90s, featuring the song “A Common Disaster” which was the first Junkies song I ever heard. I was hooked. Now it’s time for me to make tuna casserole on this snowy windy extended-winter day. This white stuff needs to go away, and since we’ll be back in the 50s by Saturday it shouldn’t be here long. Fingers crossed. I’ll see you next week. We actually have one more concert to see before next Thursday. This time it will be at the State Theater in Minneapolis, a larger and more traditional venue but a great one nonetheless. As always, if you perused my ramblings and found them to be generally agreeable, please click on the “Like” button at the top. It’s super-duper cool when you do that. Bob Wilber, at your service and still marveling over Margo Timmins and Cowboy Junkies.